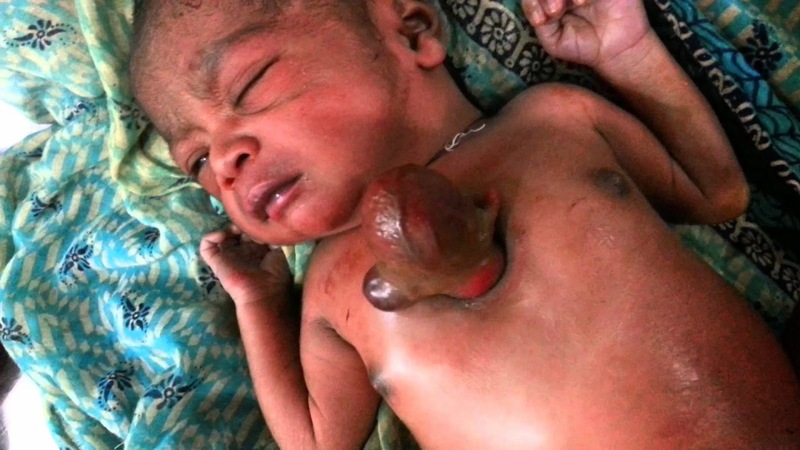 ﻿﻿Ectopia cordis is a congenital malformation in which the heart is abnormally located either partially or totally outside of the thorax. The ectopic heart can be found along a spectrum of anatomical locations, including the neck, chest, or abdomen. In most cases, the heart protrudes outside the chest through a split sternum. Ectopia cordis results from a failure of proper maturation of midline mesoderm and ventral body wall formation during embryonic development. The exact cause remains unknown, but abnormalities in the lateral body wall folds are believed to be involved. Normally, the lateral body walls are responsible for fusion at the midline to form the ventral wall. Corruption of this process may underlie ectopia cordis. Defective ventral body wall formation yields a heart unprotected by the pericardium, sternum, or skin. Other organs may also have formed outside the skin, as well. Many cases of ectopia cordis have associated congenital heart defects, in which the heart has failed to properly form. Due to the rarity and death shortly after birth, limited treatment options have been developed. Successful surgeries have been performed, but the mortality rate remains high due to infection, hypoxemia and cardiac failure. Below is a video of a baby with ectopia cordis.